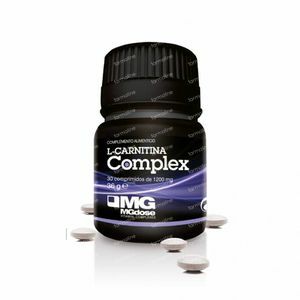 MGDose L-Carnitina Complex 30 tablets order online. L-Carnitine Complex supports a good memory and promotes the development of brains and nerves. Acetyl L-carnitine improves fat metabolism and provides additional energy. The present B vitamins and vitamin C support the energy and simultaneously protect the nerve cells. Acetyl L-carnitine *, thiamine hydrochloride, riboflavin, Niacinamide, Pyridoxine chlorhydrate, Folic Acid, Cyanocobalamin, Ascorbic Acid, Selenium methionine, cholecalciferol, microcrystalline cellulose (stabilizer), calcium phosphate, hydroxypropyl cellulose (stabilizer), silicon dioxide (anti-caking agent), croscarmellose sodium (Disintegrant), magnesium stearate (anti-caking agent). * From vegetable origin.